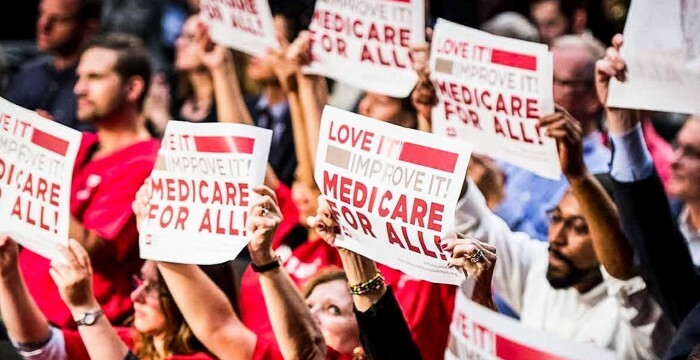 According to the latest round of polling, a majority of Republicans (52%) say that they support a “Medicare for All” policy here in the United States. This goes along with majorities of both Democrats and Independents, so the big question now is what are we waiting for? The public wants this to happen and Congress needs to make this a reality soon. At this point, the policy is an inevitability, so why waste any more time? Ring of Fire’s Farron Cousins discusses this. This entry was posted in medicare supplement and tagged current videos, Donald, Donald Trump, Farron Cousins, healthcare, Medicaid, medicare, Medicare for All, politics, progressive news, socialized healthcare, socialized medicine, the ring of fire, The Young Turks, TROFire, Trump, Trump administration, TYT. Bookmark the permalink. Medicare for ALL. How do we pay for it? We already are. Everyone’s behind it except for the people paid to be against it. Andrew Church really I wonder what other secret knowledge is in that head of yours. I wonder what proof you have for that? Because their donors don’t want medicare for all. We need to get money out of politics. That is the underlying issue, get money out of politics and the republicans will pivot so fast, our collective heads will spin. So even right-wingers want access to health care. Shocker. Gustov – Yet, they are voting for the party that has tried 70 times to get rid of the AHCA. 21 red states are suing the fed to get rid of the AHCA. All they have to hang their hats on are the words of their cult leader. He claims it is the Dems who are trying to take away their health care and that the Republicans will protect them. That’s what happens when you chose to be uninformed. They just dont like it when its the liberals made it. Obamacare was their idea, but they are opposed to it NOW, because Obama put it in place. Hi Everybody, I think the problem with the Democrats in regards to Medicare for all is that the Private Health Care Insurance Companies are an entrenched Special Interest, that is, they have Donor Money to spend on buying politicians. When Politics is controlled by Bribery, the Old will always be the enemy of the New, and futuristic innovations that have not yet made their fortunes will be Politically suppressed because of the Political Pull of the Dinosaurs. In order to gear up for the Future we need to get money out of politics. Drug prices here in the U.K., which were already the lowest in the developed world, have dropped even lower recently since the NHS brought in a new cost limit buying system. US pharmaceutical companies tried to sue in a bid to stop the initiative but the NHS has such huge buying power theres not much they can do. Either take our business or we go elsewhere. The US allows their drug companies to rip off their citizens due to all the politicians being lobbied by these companies. You really need to stop lobbying in Washington they take you for fools. Andy Tomlins I hope you never have our problems. I sincerely do. But I’ve seen your conservative party. They desperately want to privatize the NHS to enrich their buddies. Here but for the grace of history go y’all. Andy Tomlins The prices are truly outrageous over here. Even for stuff that has been off patent for decades like Valium. If you want the brand name it will cost well over $100/month. In France the same brand name package will be around 6-7€. In Germany perhaps twice the price but still a bargain. Yep. They even like straight up benefits but in public they’ll condemn everyone else for taking them. were against Medicare for all until they got sick and now need it too. there is a reason why politicians dont run on a single payer / medicare for all platform despite favorable voter polling…its called lobbyists and corporate donors. No, I actually don’t want Medicare for All as a “public option” or something I need to buy into. I want all of us to reap the benefits of having everyone enrolled in a single payer system. Once 70% of Republicans support MFA, I think the Democratic Party leadership will start to consider it. Why on earth would someone NOT want Medicare for all?!! Why!!! KeepitReal2772 I’m sorry trump didn’t raise our tax. Bernie Sanders a major proponent of a national healthcare system himself admitted that taxes for the middle class would have to go up to fund such a program. I don’t see how the government taking the middle class money and then giving it back to them is more efficient then just letting them keep it to begin with. +Arnold Slater Because, you don’t have the middle men insurance companies skimming large profits off of the top of that pile that the middle class pays for their health insurance, and we can focus more on preventative care once people can go to the doctor for early symptoms to get things taken care of before they become serious medical problems that cost far more to treat. Some Trump voters have indepently realized they wanted this, but have been tricked into thinking Trump is the guy to do it instead of Sanders. The folks that OWN the parties HATE medicare for all. Too much $$ to be made. Medicare for gov’t only! Did you know that the Israeli foreign aid package, WHICH TRUMP INCREASED, is greater than the entire cost of the Israeli Socialist Universal health care system for Israelis? Yes, we all would like free medical care for all. The question is how to pay for it. My suggestion is to cut the military budget in half and use that money. And our military would still be the most powerful in the world. This system is rigged to make money for the rich man. Get rid of the rich man and we have enough to pay for everything . But the rich man would not let go of the rich man . So. O point in making fairy tails . Trump stealing Bernie’s platform about universal healthcare is like when Peele stole Key’s high-on-potenuse joke. Except it’s not funny this time. One word “GMOs”. So yes Medicare for ALL. Unless we get money out of politics, despite the overwhelming support, MFA will likely never materialize unfortunately. But the tide is turning!! Great vid! !